The chassis or the body? I'm not a biologist, so I won't go into a lecture on the first scenario, but I can address the second notion. The answer is (or will most likely be in our case) a little of both at the same time. More than likely, we will have the main structure of the chassis determined, base the body mounts off of it (and the remainder of the chassis as a result), but the two most times evolve concurrently, depending on which stage of development you are in. For those entering the design contest we will provide some direction on how wide the vehicle will be: wheel base, engine location, number of passengers etc. so the designs they submit will be a close match to what we're looking for, but overall the process will have to be iterative even if we have the chassis in house with the engine in place and suspension mounted since we don't know at this time and even during some of the design competition exactly what the designers are going to create. This is another aspect of the auto manufacturing mold we will be breaking - more communication between engineers and designers. Often times the designers come up with a concept of what the vehicle is to be, and "throw it over the wall" to the engineers, who have to use the space they are given to implement the necessary systems (engine, transmission etc.). This is the reason why trying to work on your own engine at home can be a nightmare - the envelope the engineers had to stuff the engine into isn't ideal for quick maintenance. Which brings up another point. Since a lot of our customers will most likely be working on their own cars and if not, our mechanics will be within a wrench's throw of our engineering staff in each facility, we are going to work closely with the designers throughout the entire process, make efficient use of the space we have, but also do our best to make the vehicle easily serviced. So there you have it - another one of life's mysteries solved (Nobel Prize, here I come)! After studying the DOT standards for lighting, it's no wonder why many auto manufacturers have huge numbers of engineers working on each aspect of a car, considering lighting is just one of hundreds of standards! It is interesting to read through the standards however and see that the lighting configurations you see on the cars on the road are held to a very specific set of regulations/requirements, yet they are all so different. 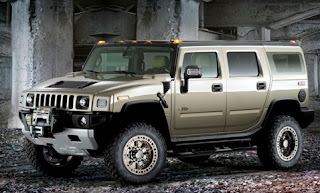 One example is the Hummer H2. If a vehicle is over 80 inches wide (the H2 is a hair over 81 inches wide), it has to have lights on the roof at the outermost points possible, both front and rear (2 amber in the front and 2 red in the rear). It also has to have three lights on the roof centered about the longitudinal axis front and rear (like you see on a lot of 18 wheelers). Not just for big, rugged looks...it's actually required! On my drive home tonight, I noticed how every car met the requirements but they do so in a multitude of different ways. This is very encouraging, especially as we prepare to begin our design competition! What that means for us and our designers is that we can work together to make sure that the requirements will be met, but we have some freedom to be creative. According to the Art Center College of Design, five billion people (representing 60 percent of the world’s population) will reside in cities within the next 20 years. Thus, design will play a crucial role in helping to anticipate and create the solutions which will enable these complex systems to function sustainably. As a way to determine how design will affect the mobility of these people, and how sustainable the designs/methods of mobility will be, the Art Center College of Design has put together a series of summits with the intent of bringing together a diverse group of designers, engineers, urban planners, industry leaders, government officials and educators to determine how future designs will impact the sustainability of mobility within not only urban areas, but sub-urban areas as well. As we set forth on the design of our first model, sustainability of that game changing design will be one of the guiding principles in all aspects of the design. We believe that it is necessary to change the way people move about, and to offer them an alternative mode of mobility that is very focused on function. Sustainable function in a wide range of environments, that is. There will be much more on this issue to come, as I will be attending the Summit, so stay tuned for a review of the brainstorming sessions, and the presentations on how designers can impact functional mobility and the degree of sustainability in general, and how we at Local Motors plan to integrate what we find there into our designs. As an extension of last night's thoughts, not only is it important to make use of available space and to place things in a certain area that makes the most sense, but HOW you place it in that particular area is also very important. Digging into the human psyche for a moment, if it isn't intuitive how a certain part of the vehicle is placed (and easy to remove/put back into place) the customer is less likely to use it properly if it is a burden to remove/replace it. A good example would be the spare tire and jack placement. I drive a lot of miles whether it be from my daily commute (55 miles each way), or the various road trips I make, I have had the bad fortune of having to change a lot of tires along the way. I can't say how many times I've been frustrated by having to remove/replace the jack and spare tire simply because the way in which the tire was held in place, how the jack fit, and having to replace the interior liner in the case of the cars I've owned versus the trucks I've owned (most times the spare just ended up in the bed, rather than under the truck). Of course in the case of off road vehicles, ground clearance is also an issue here, so placing the spare somewhere easy to access and in an area that allows for more ground clearance will be something we will have to weigh our options on if we decide to manufacture an off road capable vehicle. Also, since this particular example of having a necessary item in the proper place also impacts the aesthetics and overall personality of the vehicle, we will have to put a significant amount of thought into the placement of such an item and determine what trade-offs result and which are acceptable, as in any decision making process. Do we put the spare on the back of the vehicle like a Jeep Wrangler, Land Rover etc.? If it has a bed, do we dimple the side of the bed for the tire (and compromise payload space)? 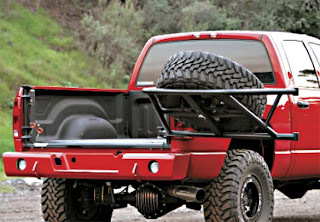 Do we build a custom rack for the tire which can also be used to hold other things inside the bed, like the tool kit I mentioned in my last entry (See tailgate rack below from "Project Heavy Metal" from Dirt Sport Magazine)? Do we still put it under the car, or in the under bed box which I also mentioned in the last entry? Surely, this is something a lot of people never consider when they think about the features of their car, but as an engineer, this simple, often overlooked detail plays into both the personality and functionality of the vehicle and deserves a significant amount of attention as a result. Just another one of the "small" details the Prototyping Engineers at Local Motors will be trying to nail down to ensure that there is a "place for everything and everything is in its place." As I was picking up supplies to build a mezzanine over the office space in our office today, I began to focus on how important it is to make the same use of available space when it comes to automotive design. One such example I like (although not of high importance to me when buying a car) is placing an umbrella holder in the door liner alla Bentleys or the VW pictured below. Not only have they made use of wasted space, but the positioning makes sense - it's where you need it to be when getting out of the car in a downpour, rather than rolling around the back seat or in the trunk. The same applies for the thought to integrate a first aid kit and where to place it secondly, in the Nissan Xterra. If you're out camping, blazing some trails or need to patch up one of the kids after soccer practice, you're probably going to open the hatch, have your patient sit in the back and perform the necessary first aid right there, so having it in the rear hatch is a good place to have it as opposed to in the glove box let's say. One of the features I'm not really keen on is the use of flip down tv's and speakers in the back of a vehicle. As an aftermarket mod, if that's your thing, than go ahead, but I never thought I'd see a set of flip down speakers available right off the production floor as in some of the new Jeep "Crossover" cars like the Compass and the Patriot. I've never really been one to use my car as a stereo, but maybe in today's world of mp3 players and iPods, this is a feature people want? I'd be interested to know how many people have been sold on these vehicles due to such features. I can see the first aid kit being a part of the Local Motors vehicle, but the others I think we can do without. One thing that I think would not only be cool, but fits the ethos of the vehicle would be an integrated tool kit, or maybe even a storage box. Maybe it could be in the rear hatch (if an SUV) or under the bed if it's a truck, like done in the Honda Ridgeline. Or, to take things a step further, maybe even have an off-road Segway folded up and stored under the bed for those tight trails! One thing is for sure - we'll have to really spend some time evaluating how our customers will be using their vehicles, and what features like this they will benefit from most, and how/where we can place them in the vehicle. - While at Borg Warner in the Timing Components Division, we were developing the timing system for the totally new V8 engine that Nissan was about to introduce in their new line of full size trucks. The assembly plant couldn't explain why the tensioners were not retaining the springs during assembly and had to halt all production until a resolution could be found since there was a risk of personal injury to the person assembling the engine and/or engine failure. Since the engineers in Japan could not make it to the assembly plant in time, it was up to me and the engineer heading up the project state-side to determine the root cause and keep production moving. - Integrating a newly acquired minimally invasive Image Guided Surgery (IGS) system into the product line of a small medical device start-up company I was working for named Z-KAT (www.z-kat.com) also on an engineering Cooperative Education assignment. Determine how to set up, run, and train the staff on the system in cooperation with the surgeons on staff. Set up Quality Control Systems. - Develop a chassis, sub-frame structure, body, interior, and electrical system (in what was mostly a two man team in about two years) for an exotic car capable of 200+ mph, 0-60 mph in 3.0 sec., use a Corvette engine and Porsche gearbox, make it street legal, and oh yeah, the customer has to be able to build it in his garage with simple hand tools and minimum to average skill level. At the time, all of these tasks seemed very daunting. Probably because they all occurred when I was about 21-26 years old (I'm 28 now), and I only had a limited knowledge of engineering principles/practices. many of the strides he made for civil rights such as leading the Montgomery Bus Boycott (which centered in large part around the now infamous Rosa Parks) were made at the same age I faced what I thought were formidable challenges. I wasn't making legal history, or inspiring and entire nation to stare adversity in the face and accept nothing but unconditional equality of life, but the thought occurred to me today that there is something in common between the two that turned the adversity into victory: having the vision - a "dream" as Dr. King put it - to see the course and maintain that course until victory was realized. So now, when I look at the task ahead for our team at Local Motors, and when I think of the nay-sayers that tell us that forming a car company can't be done in today's market, the task seems easy when compared to the march to victory made by Dr. King and those like him. "Go with what you know." The American Heritage Dictionary defines a modular object as something "designed with standardized units or dimensions, as for easy assembly and repair or flexible arrangement and use. In my experience, when it comes to manufacturing, particularly automotive manufacturing it can't be stated any better. Whether it was during my time at GE (in the Aircraft Engines division) using standardized turbine blades, electrical systems, or coolant lines across different platforms; or my time at Factory Five Racing using the same fasteners, instruments, or fuel lines from cars as different as the MK III Roadster (a replica of the famous Shelby Cobra from the 1960's)and the GTM Supercar (a modern supercar totally of our own design), modularity is fundamental in all aspects, whether the two models are marketed to two totally different demographics, the same demographic, or consumers of slightly different markets. In the case of autos manufactured by both Local Motors and Factory Five Racing, the customer is either assembling the car partially, or totally on his own, respectively. Therefore, making the cars modular makes it easy for the manufacturer and customer alike to produce each model, train the staff on the make-up of each model, explain to the customer how to build each model, and how to service each model. When it comes time for the customer to lay down his or her hard earned money, this is where modularity really counts, and is precisely what Local Motors will deliver to each customer - not just a car, but an entire experience designed with them in mind for before, during and after the sale. An example of a great use of modularity outside of my personal experiences is the newly introduced Audi R8 Diesel (yes, DIESEL!). 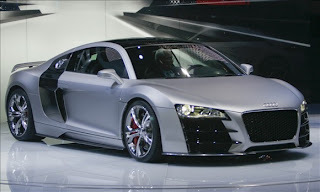 Using an engine derived from their V12 engine used in the R10 which won the historic 24 hours at Le Mans, mated to the Lamborghini Gallardo platform Audi produced a stunningly styled street car with a ferocious 500 hp and (are you sitting down?) 737 lb-ft of torque!! Of course this isn't too much of a stretch performance wise and stylistically from the Gallardo, but since it incorporates diesel technology (it gets 24 mpg), it just may bring some supercar enthusiasts over to the "green" side. For these reasons, we will maintain the principle of modularity as a cornerstone of all designs as we continue to grow our product base. For the Vehicle Engineers, the last few days at Local Motors have been full of the type of excitement to make even Home Improvement's Tim "The Tool Man" Taylor (played by Tim Allen) proud! And he approved it ALL - everything from screwdrivers to welders...swishhhhh! While researching power plants for the Local Motors performance vehicle today, I came across an interesting article on the Car and Driver website; an article that I found both very insightful and inspiring. So inspiring, I thought, "What better way to introduce myself to the Local Motors Vehicle Engineering Blog, and what we Vehicle Engineers at Local Motors are setting out to accomplish!" However, I have to admit that as an undying devotee of the LSx (particularly the LS7 which my team and I at Factory Five Racing used to pilot our GTM to a 0-60 mph time of 3.0 seconds!) series of engines, that my heart did drop a bit when I read the title! After reading the article, my fears were thankfully quelled. The article written by Alisa Priddle, titled "Bye-Bye to GM's V-8's" (www.caranddriver.com/carnews/14532/bye-bye-to-gms-v-8s.html) discusses the movement that GM is making to meet the newly imposed 35 mpg fuel legislation, enacting the cancellation of the popular Northstar V8, thus eliminating hopes for any new V8 platforms from the world's largest automaker. As we at Local Motors look closely at designing and manufacturing a performance on/off road vehicle on the scale of a truck or SUV and the possibility of using V6 diesel power, I personally find foresight into what the Big Three see as the next step into solving our dependence on foreign oil as a useful tool in the quest we at Local Motors have embarked on in delivering game changing vehicles that are not only fuel efficient, but invoke the passion and inspiration that has disappeared from American automotive manufacturing!